Burdock is tremendously useful in the long-term care of your dog and has an ancient tradition as a relatively safe, cleansing herbal treatment. There are many applications for the root, from eating it in its natural state like a carrot to softening it up and adding it to normal food. Burdock root is generally available at health food stores and other locations, making it relatively easy to find. There are many forms of it, from the natural root, dried, capsule, tincture and even teas. You’ll have to see what works out best for your four-legged friend, but quality matters. There are also topical treatments available, which can be put to good use. 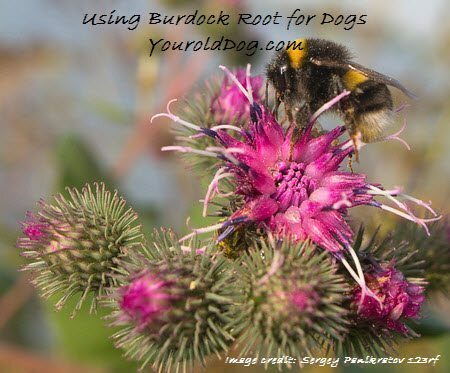 For the most part, though, burdock is an internal treatment and like Dandelion Root, it is especially good for dogs with liver issues. One thing to know about burdock is that it should be used in comparatively large doses in order to have the best therapeutic result. But, since we’re dealing with dogs; start slow and work your way up to what is the right dose for your dog without causing any digestive upset such as soft stool or diarrhea. That’s not a bad thing. Roughly 2.5 ounces of fresh burdock root has up to 61 mg of calcium and 1.4 mg of iron along with other good stuff like riboflavin and phosphorous. Its high-fiber, low-calorie content also makes it an ideal addition to your dog’s diet. Preventative Use: One of the predominant uses for burdock root in the diet is as a preventative medicine. It can help combat environmental toxins by getting rid of mutagen substances and flushing the body of pesky things like airborne pesticides and pollutants of all kinds. Burdock even takes care of free radicals, hunting the buggers down in the liver and flushing them out before cell damage takes place. Skin Issues: Specifically, burdock root can be used to treat skin conditions like psoriasis. Because these conditions can be traced back to liver function, burdock’s flushing properties once again come to bear. The liver is responsible for so much in your dog’s physiology and cleaning the body from the inside out can help in so many ways. Because burdock aids in the removal of waste from the body, you can expect to see better looking skin and hair. Blood Purifier: Burdock’s adeptness when it comes to flushing out toxins and cleansing the blood can’t be overstated. It filters the blood and helps create bile and other enzymes that break down and absorb essential nutrients properly. This will help prevent everything from allergens to imbalances from creating problems, which in turn cuts down on the risk of things like kidney stones, bladder infections and even arthritis. Liver & Kidney Health: By boosting the liver function and cleansing the blood, burdock root helps relieve pressure from secondary immune functions and subsequently frees the body up to fight what it needs to fight. Less toxic and solid waste hits the kidneys as a result of better liver function, which in turn alleviates the pressure on the organ and helps the body run more efficiently. It really is a wonderful herbal treatment. In a medium size pot, mix 1 cup of cold water with 1-2 teaspoons of the dried form of Burdock root (not the powder), or 2 tablespoons of fresh (see image below). Reduce heat and simmer for roughly twenty minutes. Turn of the heat and allow the tonic to rest for ten more minutes until cool. Strain and store in the refrigerator in a covered bowl for a week. If you notice an off odor, discard the tonic and make a new batch. Dosage for tonic: Add 1/2 to 1 teaspoon for every 10 lbs of your dog’s body weight to his food daily. Dosage when using tincture: Stick with alcohol free such as Hawaii Pharm. Standard adult dosage for tinctures is 32 drops (or 1/4 tsp) daily for someone weighing 100 pounds. This dosage can be increased by by 4. Here’s an example on figuring out dosage using tinctures for dogs: Lets say your dog weighs 15 lbs. Take 15 divided 150 and you’ll 0.1. Take 32 x 0.1 and you get 3.2. This is a little over 3 drops for a 15 lb dog. ALWAYS MIX TINCTURES with a tiny bit of FILTERED WATER (a drop or two of water) and place the drops under the tongue. In serious situations for liver, lymph and skin problems, you can increase your dog’s dosage by 4 for a daily dose. So, that little 15 lb dog would get 12.8 drops daily. Here’s a video to show you how to prepare burdock root on top of the stove. However, DO NOT use butter when sauteing. USE a LITTLE OLIVE OIL. Cook UNTIL SOFT!!! Burdock is one of the safest herbs you can use. Pregnant or nursing dogs should err on the side of caution, but there have been no toxicities associated with the root. However, Burdock could interfere with medications being given to a diabetic dog. It can even be refrigerated for several weeks following harvest and can be chopped, dried and decocted for immediate use. In other words, go nuts. Burdock is as close to a perfectly safe herb as you can get. If it’s not obvious by now, burdock root is one of the best things you can use for your four-legged friend. It helps liver function and cleanses the blood, which eases the overall burden on the rest of the body and helps overall function. It does this without any side effects or problems and the only real catch is that your dog might not like the taste right off the bat. There are ways around that, as I’ve noted. Most herbal retailers have burdock root available, so don’t be shy about asking for it. You can find it in dried forms or as capsules if you wish, but fresh burdock is also a viable option if your dog can get into the taste. Try adding a little to the food. Sometimes dogs will like to chew on the root like they would a carrot, which can create a fun little treat for your pooch. Burdock is actually a thistle in the Arctium genus, which is part of the Asteraceae family of plants. The biennial plant is native to the Old World – Africa, Europe and Asia – but has now been found worldwide I the form of several different species. When it comes to burdock, the root is what’s important. It can actually be eaten as a vegetable and is popular in Asian cuisine. It contains a great deal of dietary fiber. The plant itself is quite sturdy and it reproduces thanks to its burrs, which are located on the upper leaf axils and can stick to virtually anything. Because of this reproductive zeal, many farmers and gardeners have come to hate burdock. In my experience, coughing isn’t usually related to liver issues. I would start looking at supporting the heart and/or look into environmental allergies. Often times when they cough at night, it’s related to the heart. If you wear a collar on your dog, TAKE IT OFF! Wear a harness instead and you can easily add all the tags to a harness. Coughing can also be related to Laryngeal Paralysis. Sinus issues can be a sign of liver disease in dogs and that may cause a cough… Just a guess. I would be curious about the heart myself. Can’t wait to try for my dog, just found out he has a heart aneurysm, I could use some more advise. I hate giving him or myself any kind of man made drugs. I would include a high protein diet with lots of greens as well AND L Carnitine as well as Taurine. While I’m sorry to hear about your little one with diabetes, I extremely happy to hear how good you are taking care of her. Great job! By the way there is a natural product that you can check into to replace insulin injections. It is called Primalix Blood Sugar Balance and you can read about it here. The one that we recommend is BioPreparation and has been studied for years and years. It also works wonderfully for detached retinas because it crosses the retinal barrier. You can read about BioPreparation here on our site. If you do decide to purchase it; in your dog’s case, you want to make sure that purchase the F3 formula which is geared more for helping in healing existing issues and disease, where F2 is for general maintenance. I hope this helps Raine! Hi Janie, my 12yr old Shihtzu has just been diagnosed with lymphoma. She is currently on antibiotic for other issues but now I’m considering of giving her Burdock root tonic. Do you think it is safe to give her the tonic whilst she is on antibiotic? I’m sorry for the delay and even more sorry to hear about your old girl’s health problems. It should be fine to include burdock root while on the antibiotic and it will help flush the liver Erica. I don’t know of any contraindications between burdock root and antibiotics or other drugs for that matter. I hope this helps and I wish you all the best with your little one. What is the dosage for powdered form per 10lbs? Is it as effective given whole as in a tincture? My pup loves the taste of the chopped root that I got from Frontier Co-Op, and I think it would be easier to mix it in with her food. Is there any information about a good dose of the dried root? I make a burdock root infusion for myself for my skin and lymph system, seven years of fighting acne and all prescription meds failed but burdock is what saved my skin. I also tend to have UTI/bladder infections but when I am taking burdock root it completely keeps me healthy. SO, my question is, can I give my 17lb 6month old french bulldog puppy a little bit of the infusion I make for myself? I make it by adding 1 cup dried burdock root to 8 cups boiling water and letting it sit for 8 hours, straining and put it in the fridge. For myself I need it to be more powerful than simply a tea, wondering if her system will be able to handle it ok. Since I got her she pees in small amounts very frequently, but am told it may be a training issue as she doesn’t have a UTI and shows no signs of pain during urination. I would like to have her on this anyways as her breed is predisposed to skin issues and just to keep her healthy in general. It’s great that you use burdock root for yourself and I’m happy to hear that you want to use it for your pup. You can give her some of your infusion, but go slow. I would start with a small dosage and work up to a maintenance dosage for her. See the article again with regards to dosage. I’m thinking to start with around 1/8 tsp and as she grows increase it a little. This will certainly help with her skin, lymph and liver. Good to start her young. anyways, I was looking to make a herbal mixture to just put into my dogs food (one is 6 and the other is 11) as they both had particularly bad allergies this year. Could i just put the powder in the food instead of making a tea or tincture, what would the dosage be? In your opinion, would it be better to just give them the roots themselves as snacks daily instead of putting the powdered roots in their food? Both of my dogs are 75+lbs. Also, as per the other article about Astragalus, the dosage works out to about 4 grams per dog.. would it be better to give them 2 grams at breakfast then 2 at dinner – or could i just give them all 4 during one meal? I have a 4.5 pound Yorkshire Terrier that has very high liver enzymes. What is the best, most effective form of the burdock root that I can give to her to help with that? Excellent that you’re including burdock root for her elevated enzymes. I would give her 1/2 teaspoon twice daily. How much Burdock Root Tincture can I give my 12 lb dog every day? She has been suffering from skin allergies for a few months, going crazy scratching and biting herself. She had a vet prescribed med for 2 weeks but it didn’t show much improvement at all, beyond our wishful thinking. I remembered that I gave my stepdaughter Burdock Root Tincture about 8 years ago for severe eczema flareup and her eczema has never returned. I’m hoping Burdock Root will work for my sweet 9 year old Sadie. We don’t have fresh Burdock available here. Thank you for your help. If using tincture, I would give 2-1/2 drops mixed with a tiny amount of water under the tongue 3 x daily. I hope this helps. Won’t you come back and let us know if it helps Saide, Judy? It can help someone else! I have an ailing 12 year old Bloodhound with failing liver. I can’t get her to chew on anything or drink a tea – I bought the Burdock (Wild Harvest). They are 450 mg capsules. How many should I give her per day and should I spread them out or all at once? I have her on Dandelion Root too! What else are you feeding her Jill? Hi, I have burdock root powder not loose leaf. Can I still use it and how would I use it. Also is it as effective? I am using it for a young dog with renal failure. What else are you doing for your dog’s renal failure? My old girl is having a terrible time with allergies this summer and is possibly detoxing since going from a half raw diet to all raw a couple months ago. I made the tea, but something turned her off in her food at about the same time. I offered her the dried root to see if that was the issue. She ate the granules and wanted more. I assume that is okay. What are your thoughts? Thanks, much! Sorry to hear about your old girl’s allergies this summer. The granules are fine as long as it’s pure burdock root! Colostrum is very good for allergies. It works on building the immune system against your dog’s sensitivities. Thank you and thank you for the colostrum suggestion. I gave her that following surgery last November for a salivary gland tumor. I will do it! It’s amazing to me how my brain seems to shut down on all the potential tools to use for healing. Must be the stress I feel trying to get her bacteria/fungus under control. Great article! I frequently use calendula for my dogs allergies and compresses for her itchy eyes. I also use slippery elm for digestive issues with my dog! Great article! I’m so glad you like the article. and thanks for sharing what you use for your own dog’s itchy skin and digestive issues. I’m so glad to hear the good news for your pup. That’s really great news. I would DEFINITELY use the Burdock Root tea. Without a doubt! Burdock root is one of my favorite herbs. It is excellent for removing toxins from the liver and purifying the blood. Please keep me posted on the progresses Cindy. I would love to know how she recovers. I’m sure she’s going to do great. You’re obviously very attentive to her needs, and educated when it comes to what is good and bad for her. Hi, my 11 year old yellow lab, female, just had a thyroid tumor removed, along with a lymph node. I am waiting on the pathology report ( surgeon said most likely cancerous) how much burdock root tea should I give her. She is 73 lbs. I’m very sorry to hear about your old girl. Because of her condition, my recommendation would be to not just use Burdock Root, but use Essiac Tea. Essiac Tea includes Burdock Root as one of the main ingredients, along with seven other herbs known to be very powerful against cancer. You can read about it here if you like. Essiac tea is well known for it’s cancer fighting abilities. It will detox the liver as well. I would also feed her a home cooked diet or something such as The Honest Kitchen. I would also include a good antioxidant formula that works at the cellular level. Vetriscience makes a very good one. I can’t stress enough about diet Cindy. Diet is beyond critical. I offer a cook book here on my site for crock pot recipes which includes recipes for cancer. Whatever you decide to do, DO NOT FEED KIBBLE OF ANY KIND. Avoid all vaccinations and chemical flea and tick products. This too is a must. Yes, a piece of the actual raw burdock root can be given daily to chew on. It’s a very good source of fiber (Inulin). Thanks for the great info! I asked my pup’s vet about dosage, and she did not know anything about herbs. Where can I get some dosage information? You’re welcome and thank you as well. In the article, I share a tonic recipe with you that includes the dosage. I love your idea of using a piece of burdock root as a treat. Very good for humans, too! thank you. i needed this reminder, and did not know how to use the root. i have made tea with it for myself, and used the powder, but this should be great! according to chinese meds, all ailments spring from kidney/ liver meridians. so we can help our older dogs. You’re welcome and you’re right about TCM in that “all ailments spring from the kidney/liver meridians. Taking special care of the kidneys and liver should be a priority for every dog owner, whether the dog is young or old. Of course, starting a healthy routine while the dog is young is ideal.